June's research focuses on the multiple strategies indigenous rural communities undertake to assert their usufruct over territorial domains and conserve their forests and waterways, including maintaining customary management of community forests. 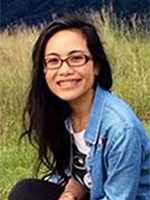 Her research strategy combines two scopes: an analysis of what motivates communities to conserve forested landscapes and what strategies do they undertake (from a landscape ecology perspective), and an analysis of what happens when these strategies get entangled with the politics of 'closing down' toward particular power narratives and associated pathways of conservation landscapes in Sarawak (from a political ecology perspective). Using mixed-methods of rich ethnographic and historical accounts, and GIS mapping, this project aims to conduct a comparative study on rural and peri-urban indigenous communities in Sarawak that face different pressures to develop their forests, and thus employ diverse strategies to assert their usufruct over land that may lead to successful conservation of forests. Rubis, J.M. (2017) Ritual revitalisation as adaptation to environmental stress: skull-blessing in Bidayuh communities of Borneo. Third World Thematics, 2(2-3): 356-375. Rubis, J.M. (2016) Solar, Sustainability, and Strategies in Sarawak. EnviroSociety, 3 February.